It is always a little tricky, when you have a big family, to find an activity that is difficulty/age appropriate for engaging the whole family. 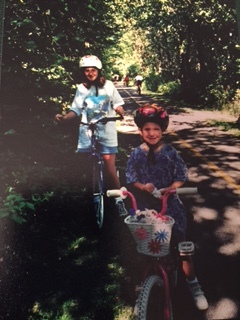 But even when we had a kid in the child seat on the back of my bike, or one or two kids on training wheels, the Collen family always loved Bicycle Sunday. The historic Bronx River Parkway in Westchester, New York, built in 1907, is closed to automobile traffic on Sundays in the Spring and in the Fall for a 13 mile stretch so bicycle enthusiasts can have free wheeling. As the family grew, our Sunday family rides waxed and waned between harder and easier. The big girls got more proficient, but then Bennett graduated from ride-along to training wheels. When Bennet mastered full-flegded two wheeler, the rolling was easy; Abigail was a back-of-the-bike rider. Our last hurdle was overcome when Abigail graduated from training wheels to riding her own two-wheeler. Even then it seemed like it happened in the blink of an eye. Eventually, we could bike the whole thirteen miles including heartbreak hill. Then the county expanded the program and closed off a bit more of the parkway for inline skating. We took the challenge, and dabbled in skating. So many wonderful parent/child interactions occured during these family activities. Sure, sometimes I had to look pretty hard to find them in the midst of tiredness, crankiness and injuries. Sometimes I was the crank; I had to force my sleep-deprived eyes opened to not miss the golden moments. Now as I look back over the photos I remember so many precious times together and the fun we had. 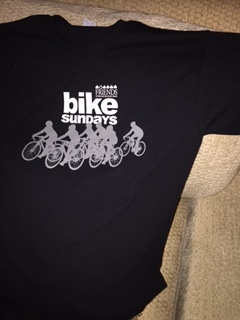 This Sunday is another Bicycle Sunday. This year the schedule is cut back (budget cuts?) 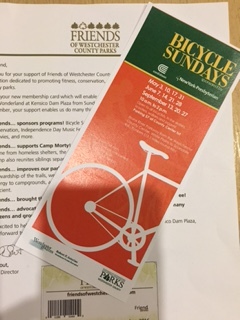 and there hasn’t been a section of the Parkway closed for inline skating in a long time, But we have made our donation and the program is still running. 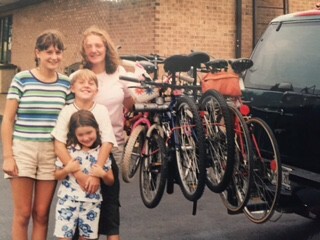 There is still an opportunity for young families to build memories and stamina and get out there and bike together. Especially these days, when it seems we are more estranged by technology and less social with each other, Bicycle Sunday seems like a great way to get a little exercise while bonding with your loved ones. By-the-way, bonding doesn’t just take place when everyone is smiling! It happens even when some people have tired legs, a negative attitude or can’t manage the entire ride. And who knows? You may see the newly expanded Collen family out for a ride down memory lane.